In this paper,we study the correlation of tissue (i.e. 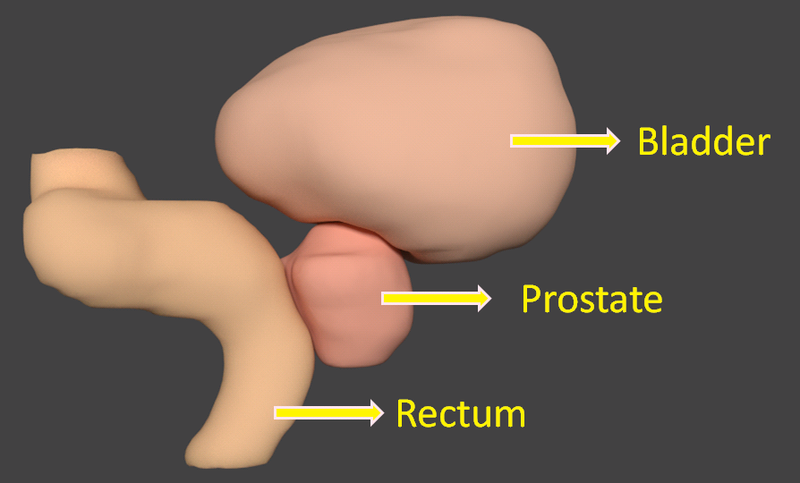 prostate) elasticity with the spread and aggression of prostate cancers. We describe an improved, in-vivo method that estimates the individualized, relative tissue elasticity parameters directly from medical images. Although elasticity reconstruction, or elastograph, can be used to estimate tissue elasticity, it is less suited for in-vivo measurements or deeply-seated organs like prostate. We develop a non-invasive method to estimate tissue elasticity values based on pairs of medical images, using a finite element based biomechanical model derived from an initial set of images, local displacements, and an optimization-based framework. 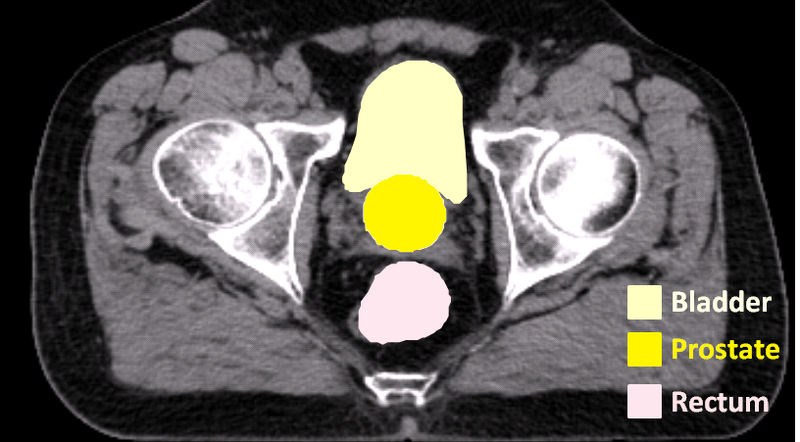 We demonstrate the feasibility of a statistically-based multi-class classifier that predicts a clinical T-stage and Gleason score using the patient's age and relative prostate elasticity values reconstructed from computed tomography (CT) images. Error Distribution of Cancer Grading/Staging Prediction for Per-Image Study. 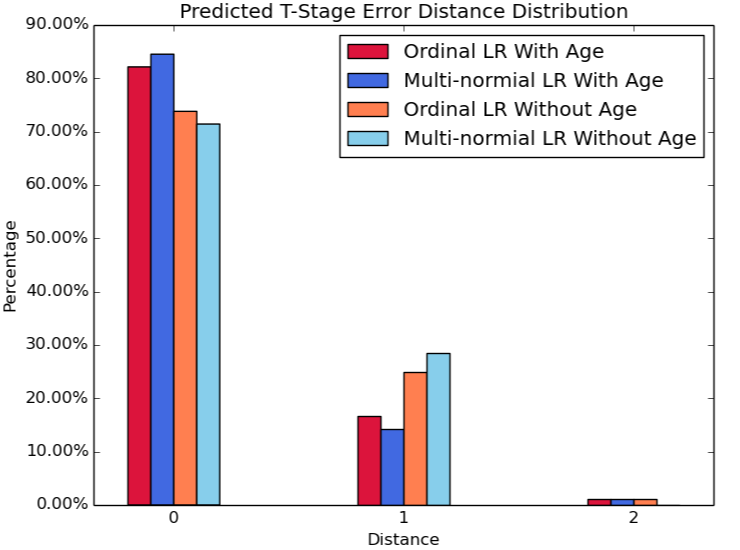 Figure on the left shows error distribution of our cancer staging prediction using the recovered prostate elasticity parameter and the patient's age. For our patient dataset, the multinomial classifier (shown in royal blue and sky blue) outperforms the ordinal classifier (shown in crimson and coral). 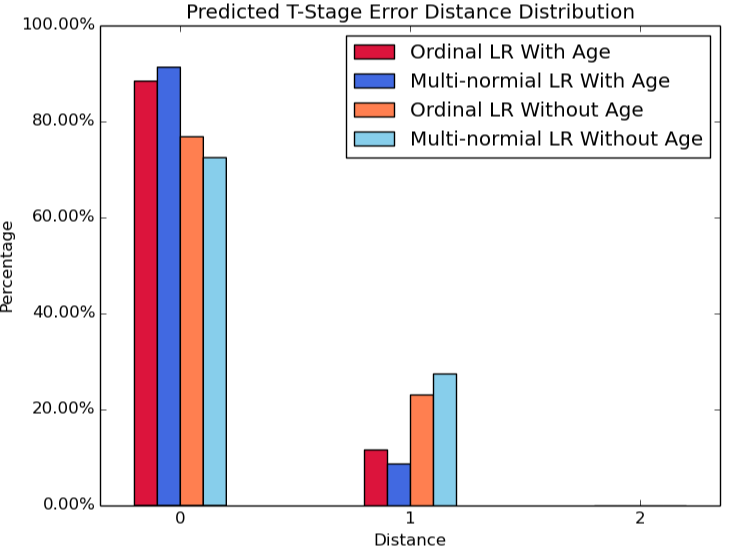 We achieve up to 91% accuracy using multinomial logistic regression and 89% using ordinal logistic regression for predicting cancer T-Stage based on our recovered elasticity parameter and the patient's age information. Figure on the right shows the correlation between the recovered relative elasticity parameter and the Gleason score with/without the patient's age. 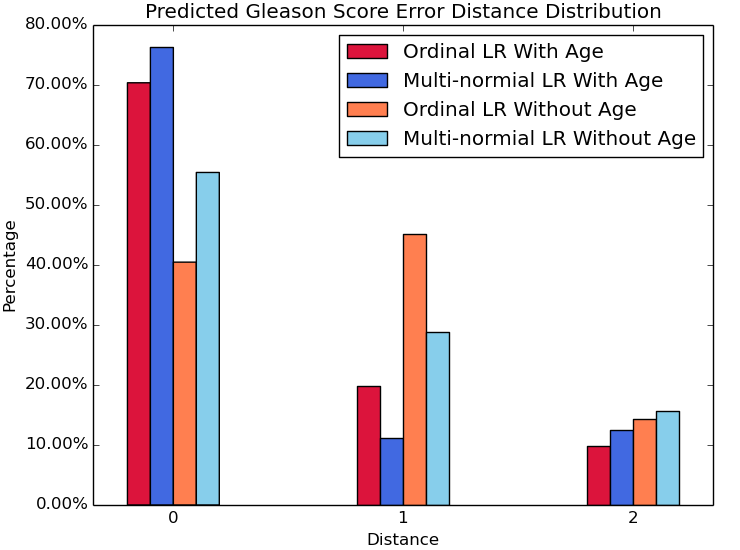 We achieve up to 88% accuracy using multinomial logistic regression and 81% using ordinal logistic regression for predicting Gleason score based on our recovered elasticity parameter and the patient's age information. Error Distribution of Cancer Aggression/Staging Prediction for Per-Patient Study. Figure on the left shows the accuracy and error distribution of our recovered prostate elasticity parameter and cancer T-Stage. For our patient dataset, the multinomial classifier (shown in royal blue and sky blue) outperforms the ordinal classifier (shown in crimson and coral). We achieve up to 84% accuracy using multinomial logistic regression and 82% using ordinal logistic regression for predicting cancer T-Stage based on our recovered elasticity parameter and patient age informa- tion. Figure on the right shows the correlation between the recovered relative elasticity parameter and the Gleason score. 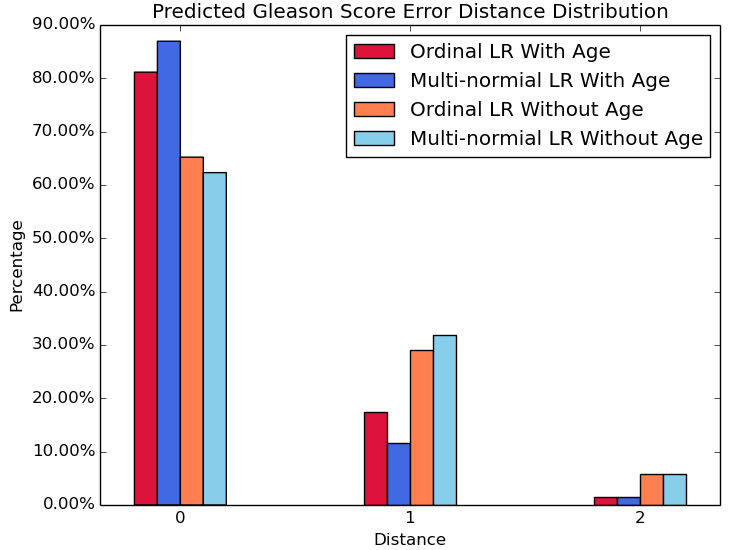 We achieve up to 77% accuracy using multinomial logistic regression and 70% using or- dinal logistic regression for predicting Gleason score based on our recovered elasticity parameter and patient age information. This project is supported in part by NIH Grant Number: R01 EB020426-01 under the joint NSF-NIH Smart and Connected Health Program.